You have options for getting macro results with your ordinary lenses. Using an extension tube to turn an ordinary lens into a macro lens is one of those options. Unlike filters and tele-converters, extension tubes don’t contain any glass optics and therefore they don’t affect the quality of your lens. Extension tubes are simply hollow tubes that create distance. 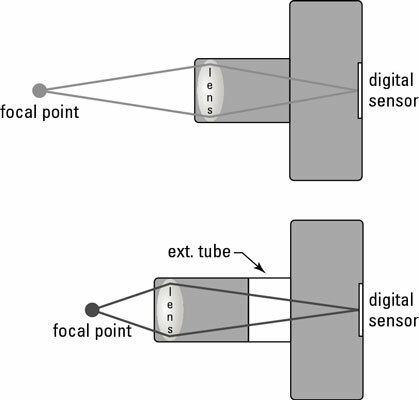 The light that is refracted through your lens passes through the tube unaffected on its path to the digital sensor. The auto-focus feature on some lenses doesn’t work with an extension tube. This is not the end of the world; because your subjects show up huge in your viewfinder when you shoot macro or close-up, you can easily adjust focus manually. However, if you prefer to rely on auto-focus, be sure to research which lenses are compatible with which extension tubes before making a purchase. You may lose the ability to select the aperture value of the lens from the camera settings when using an extension tube. Older lenses enable you to select the aperture value manually on the lens itself, but newer equipment is designed to be controlled from the camera alone. Try to find an extension tube that is electronically compatible with your lens before making a purchase. Ordinary lenses can normally focus to infinity, but when you pair a lens and an extension tube, the maximum focusing distance becomes limited. The extension tube enables you to get in closer to a subject but also limits how far a subject can be from the lens. Extension tubes place the lens farther from the camera body and add additional weight to it. This extra weight can cause problems when you need to keep the camera still at slower shutter speeds. Use a tripod to avoid motion blur. Because the lens is farther from the digital sensor when you use an extension tube, some light is lost during the exposure to the area just outside your camera’s sensor. After taking an image, review it on the LCD screen and check the image histogram (the graph that shows the tonal distribution in an image based on your exposure) to see whether you need to adjust your exposure settings.